The aims are to make progress towards producing an anchor which is capable of being certified to both CEN and UIAA standards and in doing that demonstrate to potential users of the anchor that the anchor is safe in every respect. 'Potential users' is intended to mean users at every level within the the sports of caving and climbing. The objective is to carry out tests which approximately follow the test procedures laid down by the CEN and UIAA. The axial tests are to be carried out on a minimum sample size of 32 anchors installed in Great Scar Limestone in order to be comparable with similar tests carried out by the BCA although EN959 requires all tests to be carried out in concrete. The rotation and radial tests are to be carried out on a single anchor installed in concrete as required by EN959. Andrew Hinde of Natural England and the BCA Conservation Officer, was consulted on the suitability of a site and permission was obtained to use outcrops of Great Scar Limestone on private land. 1a. Axial (tensile) tests on anchors set in 12mm holes used for the first time. 1b. Axial tests on anchors set in 12mm holes used for the second time. 1c. Axial tests on anchors set in 18mm holes. 2. Resistance to rotation test. The first tests in limestone were on anchors set using Rawl R-KER resin. After 26 anchors had been tested some of the peak loads were lower than expected. Close inspection of the anchors and holes showed that there was a problem with the resin and all of the test data were declared to be invalid. The next tests were carried out using Fischer FIS V resin. The reasons for adopting FIS V are explained in the page on resins. The anchors were installed in varying size groups building towards a minimum sample size of 32. The same method of installation was used for all the tests. All the holes were cleaned with brush and water. A Richmond load cell calibrated to +/- 1% was used mounted in a tensile test machine designed to maintain a constant direction of load throughout the stroke. Initially each of the groups was pulled out after 24 hours to provide uniformity in the curing time.The first 15 were pulled out after between 22 and 26hrs but in later tests anchors were pulled out after increasing lengths of time from 2 days to 14 days. A total of 44 anchors installed using FIS V resin were tested. Each tested anchor had a label attached recording its number, the peak load and the resin cartridge. Each hole was also numbered and photographed so that if need arises we can return to examine each hole and know which anchor was installed in it. During each installation samples of the resin used were expelled onto cardboard before and after each group of anchors. The cardboard was labeled with the anchor numbers and the resin tube. The resin samples were stored along with the labeled tubes and some nozzles. In storage either in the hole or on cardboard there is every bit of resin from the entire testing programme and the resin samples can be linked to each anchor tested. All loads are given in kilonewtons (kN). 34kN is approximately equal to a force of 3.4 tonnes. The full figures have been given to the BCA E&T committee. The 5% fractile value is the figure above which 95% of any anchors tested can be expected to reach their peak load. It is the value used by the construction industry for expressing the 'characteristic load' of concrete and fixings. 30 is the commonly used minimum sample size required to determine normal distribution. The 5% fractile figure is higher than the minimum and there is no such thing as an absolute minimum but determining the 5% fractile figure demonstrates rigour in both the testing and the analysis of the results and provides a 'characteristic strength' which can be used in comparing different anchors. All of the anchors tested were pulled from the rock with no significant rock breakage. In every case the bond failed by shearing the resin. The anchor fullfilled the requirements of the EN959 axial load test. During the course of the testing we gained skill in placing the anchors and also in aligning the puller and this might partly be the reason for the lower standard deviation of a subset of the last 30 anchors. The curing time also increased during the course of the testing. It is impossible to isolate the effects of these different factors which might affect the results. Better alignment of the puller creates less lateral distortion (bending) of the anchor. There appears to be a correlation between the amount of lateral distortion of the anchors and the peak loads which might be worth further investigation. There might also be some benefit in investigating the effects of curing time. However, these effects are minor and we can say that 24 hours of curing is sufficient for normal use of the anchors. The mode of failure was simple and this enabled the cause of the inconsistent results from the tests using Rawl R-KER resin to be recognised. Tests on BP anchors carried out by the BCA showed that the bond of the BP anchor fails in a complex way partly by failure of the rock and partly by failure of the resin. Because of the complex nature of the bond failure with the BP anchor it is impossible to isolate the effects of variation in the resin and would make comparing different resins using the BP anchor problematical. The purpose of this these tests is to demonstrate that when the anchor is pulled out the minimal damage to the rock is such that the hole can be reused for an anchor and that the second use is as strong as the first use of the hole. It would seem logical to choose the holes at random, however, it was thought that it would be more interesting to choose the holes that had previously given the minimum and maximum loads. This would test the hypothesis that the minimum was due to low curing time and the maximum was due to not aligning the puller as well as could be. The holes chosen were number 5 which was the minimum, 13 the maximum, 16 because it had previously been photographed and 29 the one nearest the mean of 35.75. The residual resin was removed with the same 12mm drill. The holes were cleaned and anchors installed as before. The resin was left to cure for seven days. The anchors were then pulled out as before. The holes which gave the minimum and maximum loads when used the first time gave values closer to the mean when used for the second time. The other two holes gave figures very close to the first use, one slightly higher and one slightly lower. An anchor placed in a hole for the second time is as strong as the first use of the hole. The hypotheses for the reasons for the minimum and maximum figures stands. The purpose of this test is to test if an anchor can safely be placed in an 18mm hole that has been used before. DMM anchors use an 18mm hole. An 18mm hole was drilled, cleaned and an anchor installed as before. It was left to cure for seven days before being pulled out as before. The same hole then had the residual resin drilled out, it was cleaned and another anchor installed. A second hole was drilled and an anchor was installed. After seven days of curing both anchors were pulled out. Both holes were then re-drilled and anchors installed to be pulled out after seven days. The two holes were designated as 801 and 802. The peak loads recorded are all below the mean for anchors in 12mm holes. There was minimal damage to the rock. The sample size is too small to be statistically significant. However, the test indicates that the strength of an anchor placed in an 18mm hole is probably very close to the strength of an anchor in a 12mm hole. An anchor was installed in concrete, a 1m lever was attached and a load of over 150nm was applied using a load cell and ratchet strap and sustained for over one minute. There was no discernible effect on the anchor. 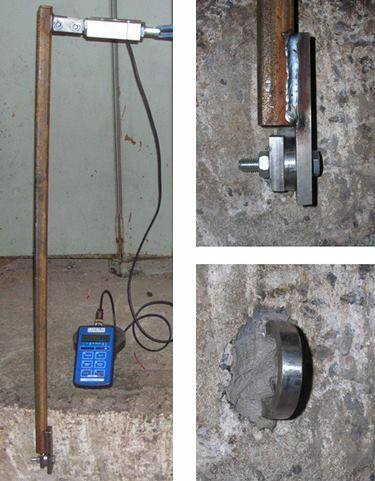 An anchor was installed in concrete and a load applied using a tensile tests machine and a Richmond load cell. EN959 requires the anchor to withstand a load of 25kN applied radially without the anchor being pulled from the concrete or breaking and for the load to be increased until the anchor breaks or is pulled from the concrete. A peak load of 52.76kN was reached before the anchor was pulled from the concrete. We are confident that the anchor has achieved the design criteria set out above. It has been tested more thoroughly than is required by EN 959 and the UIAA standard for rock anchors. The anchor complies with the standards but is not 'compliance certified' which is a different thing.